Above top: Codfish Island fernbird, Rosalind Cole. Above 2nd down: Crested grebe, M.F. Soper. 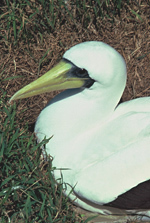 Above bottom: Masked booby, W. Murray. 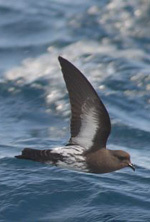 All photos above except NZ storm-petrel, Crown Copyright © Department of Conservation. The Department of Conservation recently released the 2005 New Zealand Threat Classification System list that updates the threatened status of 5,819 native plants and animals. Forty-four species of plants and animals have had a significant change in their status since the previous list was produced in 2002. The threatened status of six birds has improved, and the status of ten has worsened. The new listing for the Codfish Island fernbird Bowdleria punctata wilsoni (top left) is improved from 'nationally critical' to 'range restricted'. The original single population on Codfish Island has recovered following rat eradication, and a second population is established on another predator-free island. 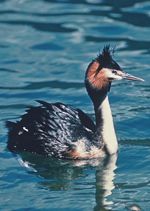 The status of crested grebe Podiceps cristatus australis (left 2nd down) has been moved one step from 'nationally critical' to 'nationally endangered' after predator control at two breeding sites around Lake Pearson, and nesting islands on Lake Clearwater. The New Zealand black-browed albatross Thalassarche impavida, also known as the Campbell mollymawk, has improved from 'Nationally vulnerable' to 'range restricted'. Recovery is thought to be associated with the reduction of fishing intensity in the mid-1980s. The Black petrel Procellaria parkinsoni is improved from 'gradual decline' to 'range restricted'. There is no current evidence that the two populations on Little Barrier and Great Barrier Islands are continuing to decline. Cat removal has helped black petrel on Little Barrier Island. In a positive change, the New Zealand storm-petrel Oceanites maorianis (left 3rd down) is now listed as 'nationally critical' after being 'extinct'. It was miraculously rediscovered in 2003 off the Coromandel Peninsula, after only being known from three museum specimens collected more than 150 years ago. There have also been New Zealand storm-petrel sightings off Little Barrier Island in the Hauraki Gulf, and three birds were banded and fitted with transmitters in 2006 near the Hen and Chickens Islands, but their breeding location has not yet been found. The masked booby Sula dactylatra fullageri (left bottom) is no longer 'nationally critical', and because it breeds only in the Kermadec Islands, and on Australia's Lord Howe Island, its status is 'range restricted'. The species Sula dactylatra has a large global range and is in decline but its IUCN Red List status is that of 'least concern'. 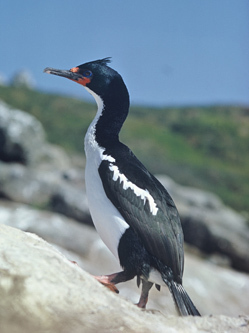 There is increasing concern for two Leucocarbo species of shag. The Bounty Island shag Leucocarbo ranfurlyi which is endemic to Bounty Island is upgraded from 'range restricted' to 'nationally critical'. The Chatham Island shag L. onslowi which was also previously 'range restricted', is listed as 'nationally endangered'. Little is known about the Bounty Island shag, but two surveys which used different methods show a large decline before 1997. Little is known about the Chatham Island shag that had a low count in 2003. The massive decline of Fiordland crested penguin Eudyptes pachyrhynchus since European settlement, which appears to be continuing is cause for the upgrade from 'gradual decline' to 'nationally endangered'. The Fiordland crested is the most endangered of nine penguin species that breed in New Zealand, and the only species that is found only on the mainland and Stewart Island. There are about 3000 breeding pairs. The grey duck Anas superciliosa superciliosa and the black-fronted tern Sterna albostriata were listed in 'serious decline' but are now 'nationally endangered'. The grey duck population is diminishing because of hybridisation with non-indigenous mallard ducks. The Ashburton River/Hakatere population of black-fronted tern dropped from 750 to 200 birds between 1981 and 1990. The North Island and South Island subspecies of rifleman Acanthisitta chloris granti and A. chloris chloris have been upgraded from 'not threatened' to 'gradual decline'. 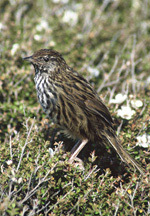 The South Island rifleman has disappeared altogether from Stewart Island and is less conspicuous on the mainland. The red-billed gull Larus novaehollandiae scopulinus has the same upgrade, with declines documented at principal breeding locations in the Three Kings, Mokohinaus and Kaikoura. After 45 years of no sighting, the South Island kokako Callaeus cinerea cinerea has been declared extinct. Copyright © 2007-2009 TerraNature Trust. All rights reserved.